The female athlete, during her reproductive years, has a complex and ever-changing milieu of female steroid hormones, whether it is the endogenous variations in estradiol and progesterone of a regular menstrual cycle, or the exogenous synthetic hormones of the oral contraceptives. Both estrogens and progestins have individual, interactive and sometimes opposing physiological actions with potential implications for the exercising female. In retrospective surveys on the menstrual cycle and performance, from 37 to 63% of athletes did not report any cycle ‘phase’ detriment, while 13 to 29% reported an improvement during menstruation. The best performances were generally in the immediate postmenstrual days, with the worse performances during the premenstrual interval and the first few days of menstrual flow. However, this type of study has an inherent built-in bias, and is further limited by the lack of substantiation of cycle phase. Many of the women studied associated premenstrual symptoms, such as fluid retention, weight gain, mood changes, and dysmenorrhoea with performance decrement. Such factors have also been causally linked with an increase in traumatic musculoskeletal injuries during the premenstrual and menstrual period. Neuromuscular coordination, manual dexterity, judgement and reaction time for complex tests have been shown to be adversely affected in women with premenstrual syndrome or symptoms, but confounding variables may include nutrition status and blood sugar levels. In addition, not all women suffer to the same level with premenstrual symptoms. Fluctuations in many physiological functions occur throughout the normal menstrual cycle. Results of early studies are difficult to interpret owing to the small numbers of women studied, wide range of fitness levels, and variability in the definitions of cycle phase. Nevertheless, investigators did not document any significant changes in measures of athletic performance as a function of timing of testing during the menstrual cycle. Swimmers have shown a premenstrual worsening of performance times, with improvement during the menstrual phase and on the eighth day of the cycle. An increase in perceived exertion was noted premenstrually and during the early menstrual stage with very intense exercise. In cross-country skiers, the best times were recorded in the postovulatory and postmenstrual phases, prompting the recommendation that training loads be selected according to cycle phase to achieve maximum benefit. Investigations using estradiol and progesterone levels as a confirmatory index of ovulation have not generally found significant differences across the cycle in either maximal or submaximal exercise responses, although a slight decrease in aerobic capacity during the luteal phase has been reported. In contrast, an enhancement of endurance performance during the luteal phase, without any concomitant changes in cardiovascular variables has also been reported. There is evidence to suggest a decrement in isometric strength and endurance, potentially related to an increase in deep muscle temperature during the luteal phase, however, little accurate information exists on the influence of menstrual cycle phase on strength. Increased progesterone and estradiol levels during the luteal phase leads to a net fluid retention because of a complex interaction of the aldosterone/renin/angiotensin systems. Consequently, there are changes in serum electrolytes, osmolality, and minor variations in haemoglobin, but these have no measurable repercussions for performance. Cardiac output is increased, primarily through an increase in plasma volume and stroke volume. Results of studies, with and without hormonal documentation, are inconsistent regarding heat stress responses during exercise. Similarly trained and acclimated men and women do not display any differences in thermoregulation. Sweat rate is not significantly affected by the alterations in steroid hormones during the menstrual cycle. Nevertheless, the higher core temperature during the luteal phase is postulated to increase cardiovascular strain (as evidenced by an increased heart rate) and level of perceived exertion during exercise. The temperature-induced increase in metabolic rate has also been associated with decreased exercise efficiency and increased mean oxygen consumption. High progesterone levels during the luteal phase and pregnancy stimulate ventilation and the ventilatory responses to hypoxia and hypercapnia. 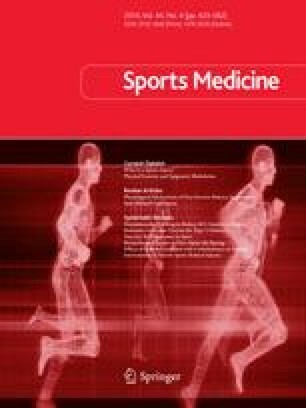 Success in endurance sports has been correlated with blunted respiratory drives, therefore enhancement of this ventilatory responsiveness may be detrimental in athletes. Nonathletic women have been shown to have altered exercise performance, possibly because of a subjective sensation of dyspnoea, but no effects have been shown with elite female athletes. A synthetic progestin, medroxyprogesterone acetate, when administered to both men and women, causes similar respiratory changes without any corresponding performance decrement. Investigators have not been able to correlate actual progesterone levels with the alterations in ventilatory drives. Estradiol acts to potentiate the action of progesterone through its induction of progesterone receptors. There is a gender difference in substrate metabolism during exercise. Estrogen and progesterone enhance muscle glycogen storage and uptake. Increased estradiol levels also promote lipolysis and lipid synthesis. A shift in metabolism towards free fatty acids leads to a decrease in glycogenolysis and gluconeogenesis. A greater urinary protein loss during the luteal phase reflects greater protein catabolism. Blood glucose levels vary during the menstrual cycle, but differences are affected by altering the pre-exercise nutritional status of the athletes. Other hormones, particularly catecholamines and growth hormone have also been shown to be important. Increased estradiol levels act to increase growth hormone, which in turn stimulates fat mobilisation. Oral contraceptives are frequently administered to athletes for a variety of therapeutic reasons. The original formulations contained higher dosages of both estrogens and progestins. Surveys showed that half the women did not notice any difference in performance, and 8% even noted an improvement with higher dosages. Musculoskeletal injuries have been shown to be reduced in women taking oral contraceptives, possibly because of a reduction of dysmenorrhoea and premenstrual symptoms. Some cross-sectional studies have found an increase in oxygen consumption for a standardised workload in women taking oral contraceptives. A slight decrease in maximal aerobic capacity with a decrease in muscle mitochondrial citrate has been demonstrated, suggesting a potential cellular mechanism. Recent investigations have shown a slight decrease in maximum oxgen uptake (V̇O2max), without alterations in any of the cardiovascular variables. Oral contraceptives appear to have little impact on strength indices, although there is limited evidence of a detrimental effect on isometric endurance. Since the androgenic actions of the progesterone component diminish with the newer preparations, there is likely no significant influence of the exogenous hormones. Synthetic steroid hormones can influence vascular volume, ventilation and substrate metabolism. Combined oral contraceptives increase cardiac output more than progestin-only formulations implying that the estrogen effect dominates. An augmented stroke volume may potentially increase oxygen delivery to the tissues, and the reduction in menstrual blood loss may also be beneficial for performance. An increase in ventilation has been demonstrated with oral contraceptive use, but the studies which showed small alterations in performance, however, have not shown any of the respiratory changes. Substrate metabolism is also influenced by oral contraceptives, with varying effects on glucose and insulin. Other hormones such as thyroxine, cortisol, catecholamines and growth hormone have a counterregulatory action. Progesterone acts to oppose insulin binding, through a decrease in insulin receptor numbers. The effects on growth hormone (GH), which is also a potent stimulator of lipolysis, depend on the relative concentrations of estradiol and progesterone, which increase and decrease GH levels, respectively. A net shift towards triglyceride use may be potentially advantageous during extended endurance exercise. Lower blood glucose levels and decreased carbohydrate utilisation found both at rest and during exercise may result from the glycogen-sparing actions of the hormones and may also reflect decreased hepatic production. In general, the effects of oral contraceptives on athletic performance have diminished with the lower dosages of these medications. The overall advantages, including the noncontraceptive health benefits, probably outweigh any small observed differences. There is, however, a large degree of interindividual variability that must be considered in the clinical situation, both during the menstrual cycle and with administration of oral contraceptives.